The Agema Hippeon Hellenikon is a superb cavalry force, drawn from wealthy landed Hellenes in the Satrapies around Baktria and Gandhara, provided to the Saka King of Kings by his loyal Hellenic Satraps and vassal rulers. The Agema Hippeon Hellenikon is a superb cavalry force, drawn from wealthy landed Hellenes in the Satrapies around Baktria and Gandhara, provided to the Saka King of Kings by his loyal Hellenic Satraps and vassal rulers. 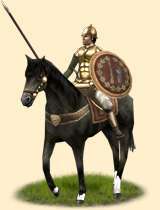 They are armed as a heavy shock cavalry, in a mix of Hellenic and eastern equipment, protected by a heavy bronze muscle cuirass, pylos helmet, and bronze plated ptyrges, while wearing trousers (once regarded by other Hellenes as effete) & cavalry greaves. Such men are an elite force, and though they rarely use their hunting bows in combat, their value as a heavy cavalry cannot be overemphasized, particularlly when used in conjunction with other Hellenic forces or the powerful Saka cataphracts. Historically, some time after the Saka began assimilating the territories of Hellenic dynasts and land magnates into their own possessions, they initiated a practice of political accomodation with the old government, calling on them to raise up levies of their countrymen for service in the King of King's army. The cavalry arm of these forces, the Agema Hippeon Hellenikon, was drawn largely from the households of the wealthy rural class; Hellenes that maintained their own estates and stables, as well as relationships with their old governors. Along with the Agema Hellenikon, these units were equipped or paid for by local Hellenic satraps and vassals subject to the Saka, and prided themselves on their connection to the old traditions of Hellas, just as their commanders hoped to lead an army in the style of Megas Alexandros or the great citizen forces of their long-abandoned poleis.